The fifth rock from the sun and the heftiest planet in the solar system, Jupiter is what's known as a gas giant — a ball of hydrogen and helium — unlike rocky Earth and Mars. 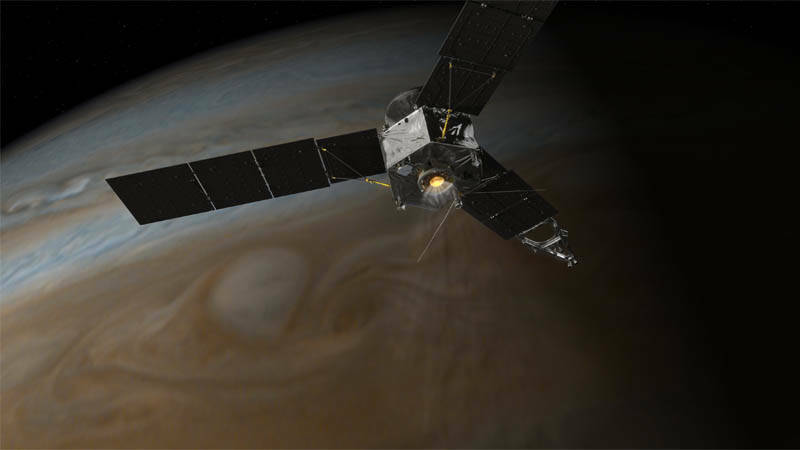 In the coming days, Juno will turn its instruments back on, but the real work won't begin until late August when the spacecraft swings in closer. Plans called for Juno to swoop within 3,000 miles (5,000 kilometers) of Jupiter's clouds — closer than previous missions — to map the planet's gravity and magnetic fields in order to learn about the interior makeup. Juno, built by Lockheed Martin, is an armored spacecraft — its computer and electronics are locked in a titanium vault to shield them from harmful radiation. Even so, Juno is expected to get blasted with radiation equal to more than 100 million dental X-rays during the mission. Like Galileo before it, Juno meets its demise in 2018 when it deliberately dives into Jupiter's atmosphere and disintegrates — a necessary sacrifice to prevent any chance of accidentally crashing into the planet's potentially habitable moons.